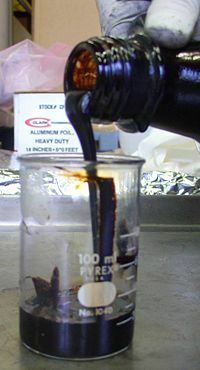 Tar can be produced from corn stalks by heating in a microwave. This process is known as pyrolysis. Tar is a viscous black liquid derived from the destructive distillation of organic matter. Most tar is produced from coal as a byproduct of coke production, but it can also be produced from petroleum, peat, or wood. The word "tar" is used to describe several distinct substances. Naturally occurring "tar pits" (such as the La Brea Tar Pits in Los Angeles) actually contain asphalt, not tar, and are more accurately known as asphalt pits. Tar sand deposits contain various mixtures of sand (or rock) with bitumen or heavy crude oil rather than tar, as does the Tar Tunnel in Shropshire. "Rangoon tar," also known as "Burmese Oil" or "Burmese Naphtha," is actually petroleum. The terms "tar" and "pitch" are sometimes used interchangeably. However, pitch has more of a solid nature, whereas tar is more often a liquid. In English and French, "tar" is a substance primarily derived from coal. It was formerly one of the products of a gasworks. Tar made from coal or petroleum is considered toxic and carcinogenic because of its high benzene content. However, at low concentrations, coal tar is used as a topical medicine. Coal tar and petroleum tar both have a pungent odor. In Northern Europe, the word "tar" refers primarily to a substance derived from wood, which is used even as an additive in the flavoring of candy and other foods. Wood tar is microbicidal and has a pleasant odor. The heating (dry distilling) of pine wood causes tar and pitch to drip away from the wood and leave behind charcoal. Birch bark is used to make particularly fine tar (tökötti). The by-products of wood tar are turpentine and charcoal. When deciduous tree woods are subjected to destructive distillation, the by-products are methanol (wood alcohol) and charcoal. Tar is used for treatment of the skin disease psoriasis, for which coal tar is the most effective. Tar is also a general disinfectant. Petroleum tar was also used in ancient Egyptian mummification c. 1000 B.C.E. Tar was a vital component of the first sealed, or "tarmac," roads. It was also used as sealant for roofing shingles and to seal the hulls of ships and boats. For millennia, wood tar was used to waterproof sails and boats, but today sails made from inherently waterproof synthetic substances have replaced the use of tar. Wood tar is still used to seal traditional wooden boats and the roofs of historical shingle-roofed churches, as well to paint the exterior walls of log buildings. In Finland, wood tar was once considered a panacea, reputed to heal "even those cut in twain through their midriff." According to a Finnish proverb, "if sauna, vodka, and tar won't help, the disease is fatal." The use of wood tar in traditional Finnish medicine is because of its microbicidal properties. Mixing tar with linseed oil varnish produces tar paint. Tar paint has a translucent brownish hue and can be used to saturate and tone wood and protect it from weathering. Tar paint can also be toned with various pigments, producing translucent colors and preserving the wood texture. Given its paint-like properties, wet tar should not be touched with bare skin, as it can dry to produce a stain. However, the stain can be effectively removed from skin by applying a paint thinner. Coal tar is listed at number 1999 in the United Nations list of dangerous goods. ↑ Geo Times, Mummy tar in ancient Egypt. Retrieved April 25, 2008. This page was last modified on 16 November 2015, at 17:05.